Mass Loaded Vinyl (MLV) is a safe, non-toxic vinyl acoustic noise barrier designed to hang as a limp mass in a variety of soundproofing applications. MLV soundproofing offers an alternative to Lead at a lower price point. Our custom-designed mass loaded vinyl noise barrier is available in one or two pound per square foot density - abbreviated as MLV 1# or MLV 2#, respectively. The industry standard unit of measure for a sound barrier material like mass loaded vinyl for wall, ceiling or floor assembly is referred to as the Sound Transmission Class (STC). A standardized test, performed in a certified, independent, soundproof lab, measures the transmission loss between a sound source (Source) and a target room (Target). Measurements are taken over a range of 6 frequency points ranging from 125Hz to 4000Hz. The sound in the Source and Target rooms is measured. The difference between the two is the transmission loss. Our mass loaded vinyl is STC rated to ensure you receive the proper soundproofing equipment for your home or office. Soundproofing systems combine mass, isolation, absorption, and damping to achieve the sound reduction results best suited for the application. MLV noise barrier adds mass in a minimal thickness. The MLV 1# is 1/8" thick. The MLV 2# is 1/4" thick. The MLV is typically embedded behind the finished walls, floor, or ceiling materials. Check out our Mass Loaded Vinyl blog for more information about this versatile acoustic product. The performance table summarizes the STC rating for the various MLV products. 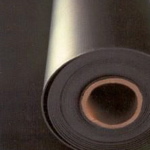 Black Vinyl Seam Tape is applied over mass loaded vinyl seams to reduce sound leaks between sheets of MLV Barrier products. 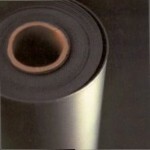 Aggressive adhesive bonds to vinyl noise barrier products. SoundAway Barrier MLV 1# Roll, 1/8" x 4' x 25', is a dense, 1 pound per square foot, flexible, soundproofing mass loaded vinyl noise barrier highly effective in a variety of noise control applications. SoundAway Barrier Roll offers an effective solution to block voices and reduce noise. SoundAway Barrier MLV 1# Roll-Wide, 1/8" x 4.5' x 30', is a high density, 1 pound per square foot, flexible, soundproofing mass loaded vinyl (MLV) noise barrier designed to block and reflect sound. Install a layer of SoundAway Barrier to soundproof walls, floors, and ceiling surfaces reducing noise transmission. SoundAway Barrier MLV 1# Reinforced, 1/8" x 4.5' x 30', is a high density, 1 pound per square foot, flexible, soundproofing mass loaded vinyl (MLV) noise barrier designed to block and reflect sound. Mount on structure to reduce traffic, pet, equipment, or music noise. SoundAway Barrier MLV PSA, wide roll, 1/8" x 4.5' x 30', greatly simplifies your installation process with a peel-and-stick pressure-sensitive-adhesive (PSA) backing on one side of your noise barrier. SoundAway Barrier MLV PSA is a dense, 1 pound per square foot, flexible, mass loaded vinyl soundproofing material designed to block and reflect sound. SoundAway Barrier MLV 2# Reinforced, 1/4" x 4.5' x 30', is a high density, 2 pound per square foot, flexible, soundproofing mass loaded vinyl (MLV) noise barrier designed to block and reflect sound.